The New York Giants closed out the 2017 season with an 18-10 victory over the Washington Redskins. The future of both teams’ quarterbacks remains in doubt, and neither did much to make a positive statement in the game. QB Eli Manning was 10-of-28 for 132 yards, throwing one interception and one touchdown. QB Kirk Cousins was 20-of-37 for 158 yards and three interceptions. He did not throw a touchdown, but he did rush for one on his lone carry. RB Orleans Darkwa was the workhorse for the Giants, carrying the ball 20 times for 154 yards. It was Darkwa’s 75-yard touchdown run that gave the Giants an early lead. RB Wayne Gallman was just behind him, carrying the ball 15 times for 89 yards. With that, we give you our PFF-exclusive takeaways from the contest for each team. Manning wasn’t helped out by his receivers, who dropped six passes in the game, but he also had issues of his own. He threw one interception on a screen pass, got strip-sacked in the pocket and had a dropped interception. He also either misread coverages or forced a couple of throws that ended up broken up by defenders. In all, he completed just two passes targeted 10-plus yards downfield. Gallman ran the ball very well, including on his final run of the game to seal the win. He forced five missed tackles on 15 runs and averaged over three yards per carry after contact. He did have a few miscues though, including a fumble and two dropped passes. There may not have been a better cornerback in all of football for the last four weeks of the 2017 season than Cockrell. The former fourth-round pick out of Duke played every single snap for the Giants’ defense from Weeks 14-17 and during that stretch, his lowest-graded game was a 79.5 against Dallas in Week 14. 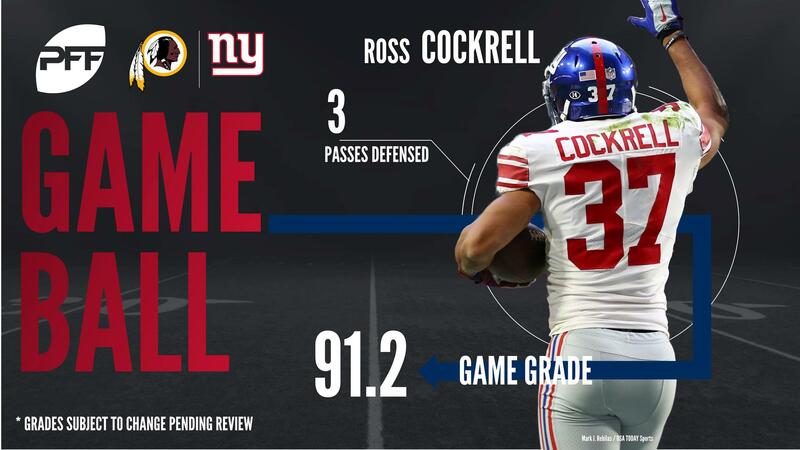 Against Washington this week, Cockrell was targeted nine times in coverage, and he surrendered three receptions for a total of 35 yards to go with an interception and three additional pass breakups. The big rookie out of Alabama has been productive all season long against the run, and that theme continued in Week 17, where Tomlinson earned an 82.6 grade in run defense. He recorded two run stops, giving him 24 on the season, which leads all rookie interior defenders. He had a productive game as a pass-rusher as well, tallying two hurries and batting a pass. This is not going to be the performance Washington fans are going to want to remember if this was in fact Cousins’ last game in a Redskins uniform. Cousins faced pressure on 14 of his 40 dropbacks, and his performance under duress was absolutely brutal. He threw as many interceptions, three, as he had completions under pressure. He ended the game with a 0.0 passer rating under pressure. The Michigan State alum also struggled to push the ball downfield, going 3-of-11 for 33 yards and an interception on throws that traveled at least 10 yards in the air. Scherff allowed just one pressure on 40 pass-block snaps against the Giants, and he also led Washington with a 79.3 run-blocking grade. Scherff broke out as one of the better guards in football last season, and the third-year pro continued to show growth in 2017. For the season, he currently ranks eighth among guards with an 83.2 overall grade, and his 86.9 run-block grade ranks sixth. Breeland was targeted three times on 33 snaps in coverage. He did not allow a single catch and broke up two of the three targets. Those two pass breakups gave him a career-high 13 on the season, ranking in the top five among cornerbacks this year. Swearinger seemed to always be around the ball in run defense, leading to five run stops in the game. In coverage, he was targeted twice and did not allow a catch, but one of the passes was dropped.